Big Finish: CICERO Review | Warped Factor - Words in the Key of Geek. SEE YOU IN COURT, says Tony. Marcus Tullius Cicero is a name that lives in history – one of ancient Rome’s greatest thinkers, philosophers, lawyers and politicians, his name is as big and well-regarded in his many fields as any of the people whose lifetimes he shared, which considering he was alive in the time of Sulla the Dictator and Consul, and also, later, the time of Julius Caesar and Mark Antony, is saying quite something. So – sure, no pressure in making him the hero of an audio release (Series? Oh please gods, say there’ll be a series?). Writer David Llewellyn takes to the task like a duck to hoi sin, pitching us a young Cicero, before any of his greatest achievements, when he’s more or less just an equestrian lawyer (equestrianism being analogous in ancient Rome to the upper middle class) with a growing reputation for oratory, and a brother who, deliciously, is the voice of both dissolute fun (‘wine-drinking, whore-shagging fun’ as he puts it – and your ears just pricked up, didn’t they? ), and enlightened self-interest (‘Ohh, because this sounds like the kind of thing we should be getting entangled in…’). The Cicero brothers – Samuel Barnett as Marcus Tullius and George Naylor as brother Quintus Tullius – are a highly attractive combination, and the first story is pitched somewhere between Lindsey Davis’ Falco novels, Robert Harris’ series of books dealing with the life of the man, and a John Grisham courtroom drama, as the brothers are hired to defend a young man accused of killing his father, who has been put on one of Sulla’s lists of enemies of the state, meaning his sons cannot inherit his rich farmlands. In itself, there’s nothing especially extraordinary about the case, but it has a whiff of wrongness, especially as Cicero realises, because he – young, making a name for himself but by no means established and heavyweight – is described as the young Sextus Roscias’ ‘last hope’ of avoiding the grisly fate meted out by Roman justice for parricides. In a hat-tip to the likes of Mickey Spillane, the fact that a dame walks into the Cicero Brothers’ offices in desperate straits is suspicious in itself – why will no-one bigger and more experienced take the case, especially when, as it quickly emerges, the supposed father-killer is a rural rube who was sixty miles away at the time, with little or no access to the kind of slaughterers-for-hire available to more cosmopolitan sophisticates in the Eternal City, and who, he claims, got on as well as might be expected with his old man? Against the better instincts of Quintus Tullius, though not a little persuaded by the idea of payment after a period of unemployment, the Cicero Brothers take the case, which involves dodgy auctions, drunken lawyers, government creepazoids, low-life heavies, age-old family friends, and a mystery that gets more and more convoluted the more they find, but convoluted in believable ways – there’s nothing about this first case for Cicero that stretches the credulity or relies on unbelievable coincidence, it’s more or less that no-one believes there’s anything to investigate, and no-one who knows otherwise banks on a man with the talents of Marcus Tullius Cicero getting interested in their business. Structurally then, it’s the kind of story that serves both the characters and the listener extremely well as an introduction – we learn the kind of man the young Cicero is – valorous but not stuffy, strong-willed, logical and studious compared to his brother, whose skills are more practical but nonetheless essential in their navigation through Roman life. 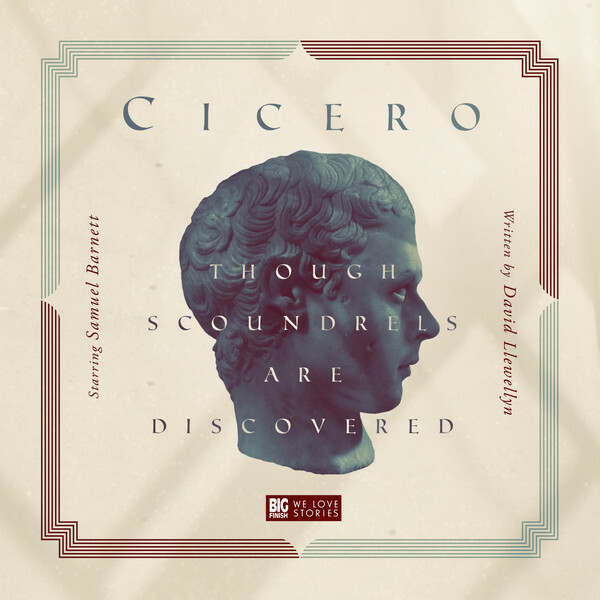 There’s a glorious sequence that brings brother Quintus to the fore as Cicero prepares for his courtroom showdown, where he intends to reveal the true identity of the murderer in front of the assembled throng. Quintus drills Cicero on his pronunciation, his diction, his pauses, honing the oration as a listener and a sounding board for his brother. There are elements of the story at which you guess before they’re revealed – as we say, there’s nothing put especially out of your way, nothing hidden for the special effect of the reveal, but nevertheless, Llewellyn’s writing and the direction by Scott Handcock build agreeably to a high-tension ‘You can’t handle the truth!’ courtroom ‘j’accuse!’ scene that evolves the traditional ‘everybody gathered in a drawing room’ revelation and manages to deliver both thrilling drama and a highly relevant cris de coeur for our day and age, as the quote at the top of this review will surely make apparent. Using what might well have been a small, untouchable case and a day in court, Cicero, as a man of principle in a corrupted world, is able to sound a warning about the whole state of the nation – both his and increasingly ours – when he goes off-script and speaks from his most profound heart. It’s an air-punching oration that many will find both liberating and cathartic to hear spoken out loud in the Age of Idiocy. It’s delicious, incidentally, that part of this story has Cicero relating the events of the case in a letter to his friend Titus Pomponius, known more colloquially as Atticus. While an entirely likely correspondence, the name of his friend rings bells of easy identification for us – Cicero stands in this story like another famous literary Atticus, Atticus Finch in To Kill A Mockingbird, defending the seemingly indefensible, and standing as a man of principle and intellect in times eager to take the easy, lazy option and lead to the death of an innocent. Cicero is by no means a crusader, any more than Finch was, but this first release shows him as an honourable, thorough, intelligent man, with a stalwart, if rather more sarcastic brother by his side to help steer him through the murky waters of ancient Rome’s many worlds and strata. Two months in, 2017 has already given us more treats from Big Finish than we might have had any reason to suspect. Going out on a limb, we’d say Cicero is going to take some beating if it’s not to remain our favourite Big Finish release of the year. More, more, more please!